PROBATIONER GARDAÍ WHO are due to be attested at the end of this month have been told they are being temporarily re-allocated to cover traffic duties in December – and their two weeks of leave next month are cancelled. The Irish Daily Star reported this morning that the move was ordered by Deputy Commissioner John Twomey. A garda memo states that following attestation on 30 November, probationer gardaí in this particular intake of 202 recruits will be initially allocated to either the Dublin Metropolitan District or one of five urban centres; Cork, Galway, Limerick, Waterford, or Drogheda. They will be expected to report to these stations from 3 December to assist with roads policing and traffic management. 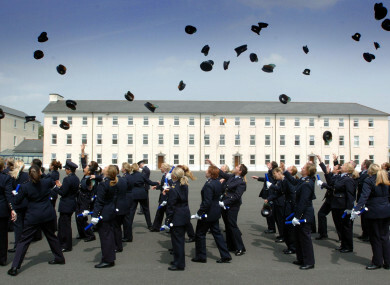 Normally new recruits get a period of leave directly after their attestation. Now this leave has been cancelled and they will be given time off in lieu from 5 January to 17 January 2019. General secretary of the Garda Representative Association Pat Ennis said these newly attested gardaí had previously been notified of their station allocations, which are in different parts of the country. He said “in the midst of an extremely difficult housing accommodation crisis”, a number of them made arrangements and secured affordable accommodation based on these allocations. “They have now been informed that they will be re-allocated away from the original stations already advised to them to other stations, thus potentially incurring further costs,” he said. We acknowledge the Commissioner’s right to manage and superintend the force. However, this right does not negate garda managements requirement and responsibility to plan appropriately in predictable operational situations including roads policing and traffic management. Ennis said this “unnecessary and avoidable disruption to their lives” will not instill confidence in them with senior management of the garda organisation. Wellbeing and a duty of care for members of An Garda Síochána including the newest members of the force, must be more than aspirational for garda management. In the garda notification, management said it is acknowledged that this initial deployment will “significantly inconvenience” a number of the probationer gardaí concerned. It states that the decision of Deputy Commissioner John Twomey, was not taken lightly and is “deemed necessary to meet the operational requirements of An Garda Síochána over the festive period”. A spokesperson for An Garda Síochána said students were informed in the first couple of days of starting in the college that they may be required to “assist with community safety measures such as increased police visibility and roads policing in the run up to Christmas”. Garda management did not respond to a question from TheJournal.ie about whether it would be assisting these probationers in sourcing new short-term accommodation. Email “Garda management makes 'inexcusable' decision to move recruits last-minute and cancel their leave”. Feedback on “Garda management makes 'inexcusable' decision to move recruits last-minute and cancel their leave”.